2001 World Series Game 3, Yankee Stadium, October 30, 2001. The ceremonial first ball is a longstanding ritual of American baseball in which a guest of honor throws a ball to mark the end of pregame festivities and the start of the game. 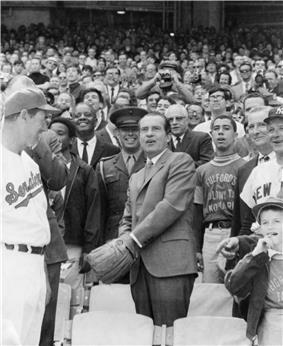 Originally, the guest threw a ball from his/her place in the grandstand to the pitcher or catcher of the home team, but the ritual changed after Ronald Reagan threw the first pitch on the field at an unscheduled appearance at a Baltimore Orioles game. 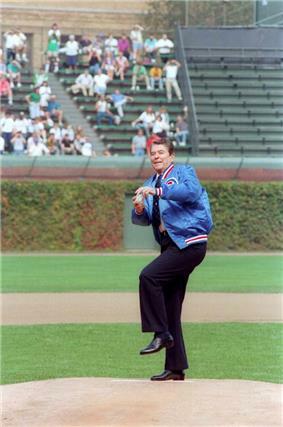 Now, the guest stands in front of the pitcher's mound and throws towards the home plate. He or she may also sometimes stand on the mound (as a pitcher would). The recipient of the pitch is usually a player from the home team. Former Japanese Prime Minister Ōkuma Shigenobu was the first person to throw a ceremonial first pitch, doing so at a 1908 game in Koshien Stadium. President William Howard Taft started the American tradition in 1910 at Griffith Stadium, Washington, D.C., on the Washington Senators' Opening Day. Every President since Taft has thrown out at least one ceremonial first ball or pitch, either for Opening Day, the All-Star Game, or the World Series, usually with much fanfare. 2015 American League Division Series George H. W. Bush Minute Maid Park Former President Bush, aged 91, accompanied by his wife Barbara and in a wheelchair with a neck brace, threw the Houston Astros' first pitch at Game 3 of the ALDS against the Kansas City Royals. ^ a b c Wallner, Jeff. 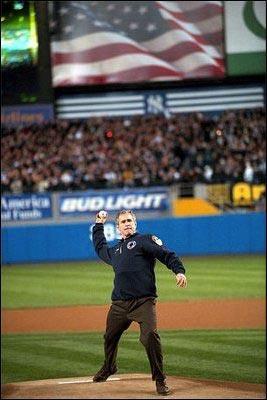 "President Bush tosses Opening pitch," MLB.com, Monday, April 3, 2006. 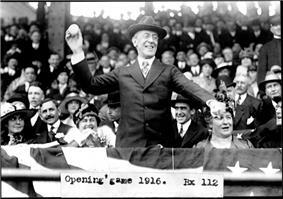 ^ President Woodrow Wilson Baseball Game Attendance Log – Baseball Almanac. ^ , Tuesday, April 4, 1989.The New York TimesDowd, Maureen, "Bush Takes Mubarak Out to the Ball Game,"